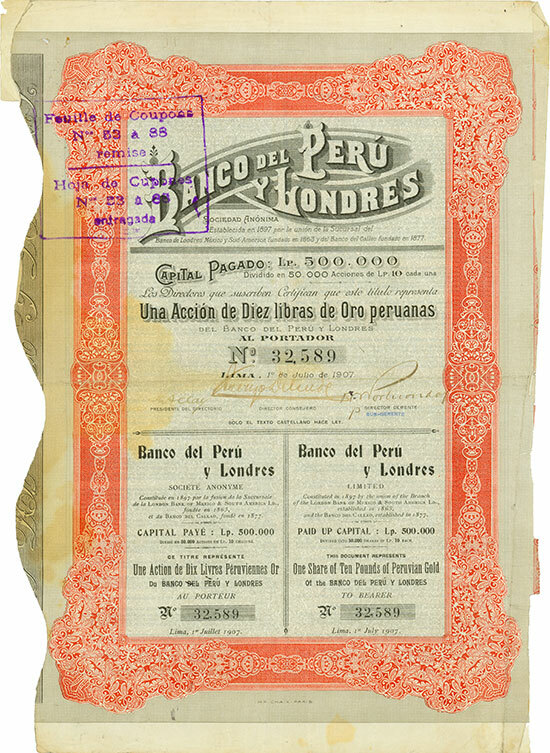 Lima, 01.07.1907, 1 Share of £ 10 Peruvian Gold, #32589, 36 x 25,5 cm, orange, grau, schwarz, KR, Knickfalten, Stempel, kleine Randeinrisse, links verfärbt (10 x 15 cm), dreisprachig: Spanisch, Französisch, Englisch. Lima, 1 July 1907, 1 Share of £ 10 Peruvian Gold, #32589, 36 x 25.5 cm, orange, grey, black, some coupons remaining, stamps, small tears, discoloured at left edge (15 x 10 cm), text in three languages: Spanish, French, English. Die Bank entstand 1897 aus der Fusion der Banco del Callao mit der Filiale der London Bank of Mexico and South America in Lima. The bank was created by merger of the Banco del Callao and the branch of the London Bank of Mexico and South America in Lima in 1897.